Before you read this you should know I might be carefully tiptoeing on to a soap box. **Consider yourself warned. ** But I am genuinely confused about a recent revelation. Maybe you can help? In the past couple of weeks, I have heard more than one tale of people who remove their wedding bands when they go out on the town. Men and women alike decide it is more “fun” when they are on a girls’ night or a boys’ night to strip themselves of this outward symbol of marriage and, I can only assume, also their inhibitions. I have been thinking about this, and I am both annoyed and confused by this behavior. I mean, my husband and I have referred to our wedding rings as “the smallest handcuff in the world.” But we joke. (Seriously, just jokes.) Not to mention, it would take a hack saw or a tiny bullet to shoot my ring off this pudgy finger, which does make it a little like a handcuff. With this trend, I am concerned about a few unsuspecting souls. (Now obviously, if this “fun” behavior is agreed upon by both parties…whatever floats your boat, people. My boring self will stick with keeping my ring on at girls’ night.) But if this is in secret, what about the husband or wife that is out of town on business or at home with the kids? 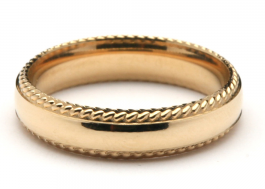 Are people just throwing caution to the wind and their wedding ring in the jewelry box? (I mean, where do you keep it?) Is someone considering how their spouse might feel about this missing accessory? But there is something else that outrages me. What about those people out there who are truly trying to find that someone special and they find….somebody else’s someone special. Is it really fair to trick those people? Why bring them into whatever unhappiness you are breeding? Even if this is the agreement you have with your spouse, my friend looking for Mr. Right is not part of this agreement and does not deserve Mr. I-Don’t-Wear-My-Ring-Sometimes. Mostly, I really just do not get it. I am making some assumptions here, but nothing too drastic, so bear with me. You choose to get married; it was not some arranged commitment that involved a dowry and some goats. I am not going to promote nor dissuade divorce. We live in a place where that is a real and – from what I understand – relatively manageable process. Doesn’t it feel just a little bit like a Lifetime movie or a bad sitcom to “Go out on the town and take your wedding ring off?” I am just annoyed that I have heard this tawdry tale before and did not think it was really a common practice of people I know. Isn’t life, marriage, love, jobs, kids, laundry, and an iCloud complicated enough? Don’t you already feel like you are barely keeping up? Call me lazy, but this ruse just seems like more work. With recent debates about who should and should not be allowed to get married (another discussion for another day), shouldn’t you just put your tiny handcuff back on before somebody gets hurt? This entry was posted in Family, Lara Winburn and tagged Columbia, every woman blog, Famously Hot, Lara Winburn, marriage, Midlands, South Carolina by lexingtonmedicalcenter. Bookmark the permalink.